Most of us are not aware of our toxicity levels, because we become polluted over time and gradually forget what it feels like to be healthy and energetic. A sure sign of a body in crisis is a chronic disorder such as Candida albicans, high blood pressure, allergies, Irritable Bowel Syndrome, fibroids, Arthritis, Fibromyalgia or Chronic Fatigue Syndrome. For many of us, frequent bouts of gas, bloating, or feeling run-down are signals from our body that we need to detoxify. Even in the absence of specific symptoms, aging itself reduces the body’s ability to detoxify. Unfortunately, our world is getting more toxic every day! We not only accumulate environmental toxins and meta­bolic wastes year after year, due to the Standard American Diet, many also lack the necessary nutrients needed by our bodies to truly nourish each and every one of our cells. Most of us take supplements or think we ought to because we are aware of our increased bodily need for nutrients. However, what is lacking is the awareness of the important fat-soluble nutrients that are needed for rebuilding and cleansing each cell and every organ. These fat-soluble nutrients such as vitamin A and D, and Activator X bring necessary nutrients into our cells. Butyrate acid works to rebuild our colonic mucosa from the ravages of modern foods, and Conjugated Linoleic Acid keeps our immune system strong. What Happens When You Rebuild and Detoxify? Above all, you heal. You will feel better. Your body will be able to utilize nutrients, systematically eliminate toxins, rebuild damaged organs, tend to the demands of the cells, and create the needed energy to live daily life and to regenerate health. Daily living, without adequate nutrients, drives toxins and diseases further into the body, while rebuilding and cleansing permit these wastes and diseases to surface and leave the body via the skin, lymphatic system, lungs, colon, and urinary tract. Consequently, rebuilding and detoxifying can make one feel sick for a while. When people quit smoking, for example, they are very often surprised at the number of colds they get during the months after they have stopped smoking. They thought they were improving their health, and suddenly they find themselves in the midst of a fiery healing crisis. A similar situation can occur with a program such as the Optimal Health Center's Plan. Although this cleansing response occurs for many, not every one experiences it in the same manner. What you need to know while detoxifying is that any symptoms of ill health are usually not due to a cold virus at all, but are rather the body’s way of throwing off accumulated toxins and damaged cells. Within the sweat and phlegm leaving the body are many toxic, carcinogenic residues of PCBs, heavy metals, phenolics or whatever accumulated poisons your body might be carrying. The pay off is the increased energy, mental clarity, and emotional freedom you experience as you follow the plan. For most clients, the dietary and detoxifying program brings better health. The Optimal Health Center’s (OHC) Detoxification and Nutrition program is not only a much needed cleanse for the body but allows for a complete change in dietary and lifestyle habits for sustaining long term health. It is a 35-day program that can best be understood in terms of ten-day milestones. The activities included in each of these milestones are described in detail in Kristina Amelong’s book, Ten Days to Optimal Health. This first milestone includes a colon cleanse and a daily nutri tion plan. Together, these provide the intestinal track and the immune system with a fresh start. This milestone provides an opportunity to assess energy levels, mental alertness, and the presence or absence of pain. 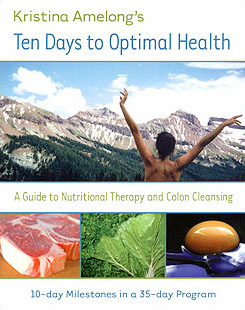 A second colon cleanse occurs on Day 10, followed by ten more days of the daily nutrition plan. Much like milestone #2, this milestone offers an opportunity to assess your progress. A third colon cleanse occurs on Day 20, followed by ten more days of the daily nutrition plan. This milestone includes a five-day fasting cleanse that includes three colon cleanses and a gentle conclusion to the five-day fast with support provided by supplements and nutritious-liquids. Please visit our site to download a FREE copy of the 10-Day Diet.